Another bumper edition with two weeks rolled into one because my work and personal lives are now so hectic I don't really know where I am or what I'm supposed to be doing on a daily basis! Annoyingly, things I had intended to write in my 'week 12' write up about horses to follow and the like will now seem somewhat disingenuous given that one of them won during 'week 13'. So the moral of the story here is that I need to pull my finger out and get writing as soon after the weekend as possible so as not to overlap my posts and meetings! 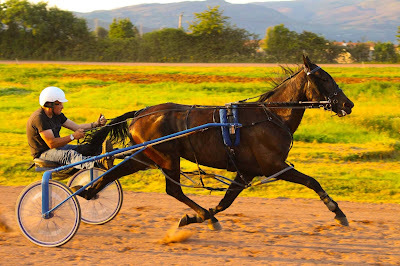 This week I was able to get to Corbiewood on Tuesday evening to watch Stevie and Ace work out. Normally I have to miss workouts as Smarty and the Gaffer take the horses during the (week)day, which clashes with me being in work. So usually I'm resigned to receiving text reports within half an hour of the actual work out, and then a full rundown when I get home from work that night. Because the Gaffer was (unusually) working dayshift, and with the weather on Tuesday being so hot and clammy, we waited until 18:15 to head over to Bannockburn. 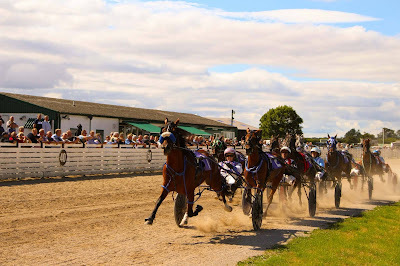 Upon arrival it looked as though there would be enough horses there to stage a couple of races, with the Paterson stables, two sets of Mackenzies, the Moran/McPhail duo, the Carson stables, the trainers based at Corbiewood and us there. Then when a bus load of French teenagers turned up and camped out in front of where the bookies usually stand...all the ingredients were there for a meeting! It was a beautiful night to work horses out, with both of them getting double heats (a slow mile followed by a half hour rest, then a faster mile). 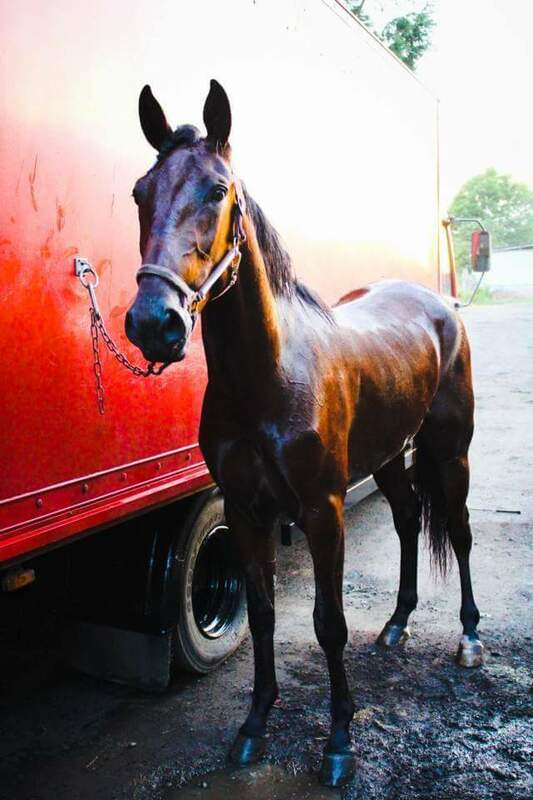 Ace was due to race three days later at Corbiewood, potentially her last race before the Breeders Crown All American Fillies on 2nd August, and Stevie is due to work out next week on the Thursday night meeting in preparation for the Golden Anniversary two-day fixture. We were pleased with both of them, and enjoying chatting to everyone so much that we didn't leave the track until 22:15...although we were the last ones out of there! (Except the French teenagers, who were having a party in the bar). We returned to Corbiewood three days later with Ace to race in her second lifetime start. Drawn 3 on the gate with the hot favourite Dynamic Ace drawn outside her, she landed in second behind 'the other Ace' and put in a strong performance to finish second, well clear of the third placed horse. 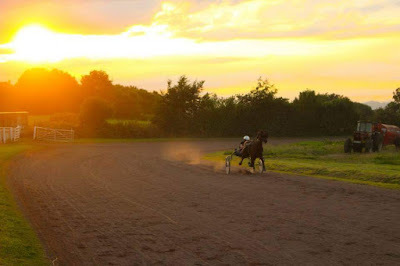 She improved her PB from the previous week by half a second on a night when many horses who had raced the week before lost 1, 2 and even 3 seconds so we were a happy camp. The full report from the meeting can be found here. I've now been able to embed links to the video race replays into the reports, which is fantastic as those who read the articles can actually see what we get to see every week at Corbiewood. This wouldn't have been possible if it wasn't for Elizabeth O'Neil, who for some years now has filmed the races at Corbiewood (and other meetings across the UK when she is in attendance). Elizabeth joined the team behind the SHRC Facebook page a couple of months ago and I'm really glad that she did as our page is now at the forefront of social media sites within our sport for providing information, photos and race replays. A horse to note going forward is Ladyford Lad, who put in an exceptional performance running two wide throughout to finish third. Keep an eye on him! (Note: this is the part where I seem like I'm being disingenuous as Ladyford Lad went on to win in what is now deemed 'Week 13'...conveniently covered in this post. Just believe that I genuinely noted his performance in the OAPs Pace). 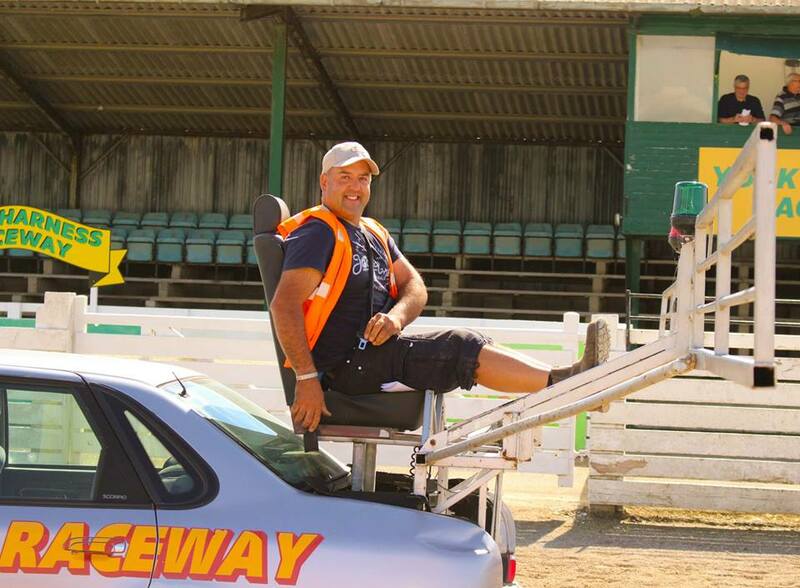 In my last post I eluded to the debacle surrounding the staging of the Evenwood fixture on Sunday 24th July. 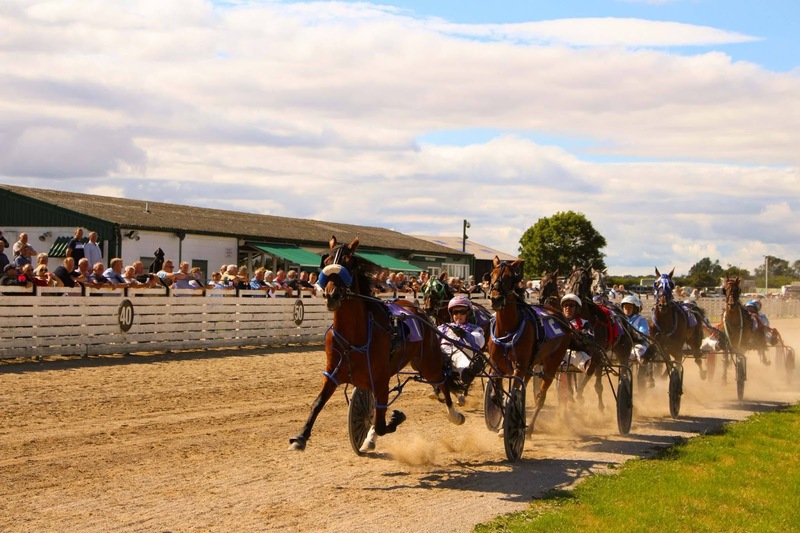 The BHRC had previously granted this date to the committee, who subsequently secured the half mile hard track at York Harness Raceway for the event. At which point the BHRC withdrew their consent for the fixture to go ahead (my understanding being that Tir Prince, who were due to stage a meeting 2 days later and who had not previously objected to the fixture prior to a venue being announced, objected to the fixture at York). However, the committee were advised that they could stage their meeting ANYWHERE ELSE OTHER than York. Baffling right? Like, totally, utterly baffling. Head scratching kinda stuff. You just sit and think, 'is this REALLY what we're up against?' A governing body who can't see the wood from the trees and would happily leave the licence holders of the North East out in the cold, and promoters and tracks who really only care about themselves and not the sport as a whole across the entire UK. It used to be only during the winter that I used to feel the familiar despair as the politics consumed everyone in the absence of racing. Now I can barely get through a week without wanting to switch off all contact with the outside world and taking up residence in the corner of Ace's stable with a shotgun and my dog to ward off intruders. Aaaaaanyway, before I go off on one again (and once I start I may not stop, because quite frankly I've heard it all in the past couple of weeks), the meeting was moved to a new venue near Binchester, Co Durham. It was promised to be a perfectly flat, five eighths of a mile, grass track. Hard to believe such things exist and we never knew about them but exist it did and it delivered on its promise. The weather as we drove down the hill towards the track didn't fill us with much confidence, nor did the lack of signage anywhere along our route (and indeed at the gate to the field) or the very rough track leading in (we have a low car and Smarty is not known for careful driving). The track was amazing. A five eighths of a mile grass track, perfectly level from start to finish, with ample parking for spectators and competitors. The racing was great to watch, especially as it took drivers a couple of races to get to grips with the long straights and different tactics required to win. I was disappointed not to see more people there, both from within racing and the local community, however I do appreciate the short notice of the venue etc. and how this may have impacted on turnout. So what I will say here, and I will say it to the organisers as well, is that going forward if this venue is going to be utilised once a year, twice a year or 15 times a year, I would like to volunteer my services to help promote in the local area and draw in the general public. I have a whole host of ideas to get newcomers in, which have already proven to be fruitful in Scotland this season and last season. Thankfully the weather improved and those of us who were there enjoyed the racing enormously. I will admit that both Smarty and I had altered opinions when we left the track and look forward to going back. I doubt we're alone in that opinion. Before I move on to the following week's action, I'd just like to shine the spotlight onto a 3YO colt, Arts Pace Hill, owned and trained by Jody Foody and driven by Andrew Cairns. Having won the week previous at Wolsingham by 15 lengths, he was the hot favourite at this meeting. He did not disappoint, setting a new 3YO Grass Track Record in 2.00.8. Very impressive! 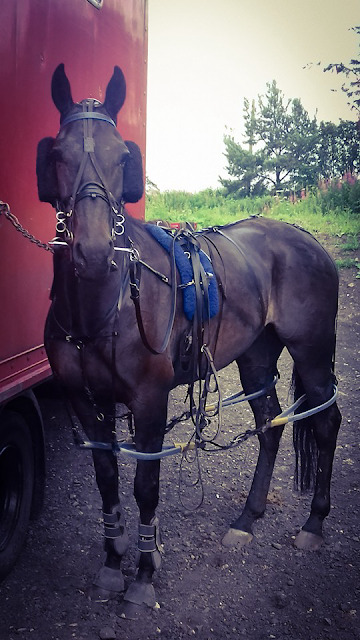 On our return to Corbiewood on Thursday 28th July we took Young Stephen to run in a schooler in preparation for the two day Golden Anniversary meeting at the track on Saturday 6th and Sunday 7th August (see the awesome promo video from Kareen New here). We were pleased with his run, and once he was untacked and washed down I was free to watch the racing. Again, rather than replay the full evening's events, through the power of the interweb I can direct you to the Harnesslink report written by yours truly - Corbiewood 28th July report. What I will say is that it was great to see my friends winning. Firstly Ladyford Lad, aka Gilbert, owned and trained by Gregor Menzies and Lisa Farrelly. A firm family favourite, I was touched by the words of their youngest, Connie, when she walked up to me after the race and said 'me so happy'! That's beyond cute. In the very next race, my 'brother from another mother (and father)', George 'Gee Whizz' Carson's GDs Baby won with Grant Cullen driving. Great result for the whole family and naturally Michael [O'Neil] and I had to run from the car park where we had our trailers and horses all the way to the winner's circle to get into the photo. 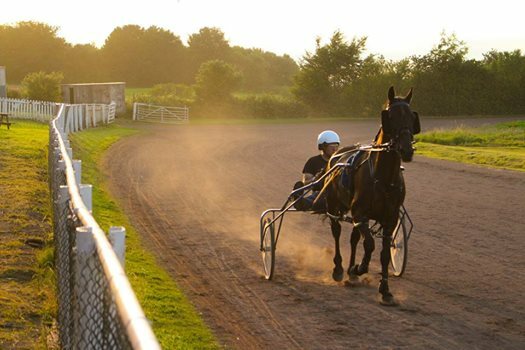 From the premier track in Scotland, we headed to York for the first meeting to be staged there in 2016. 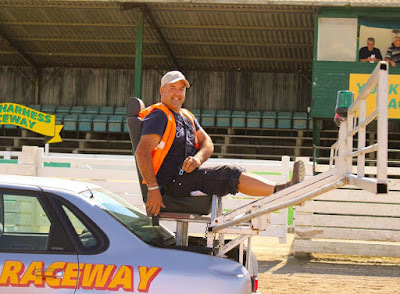 Unfortunately, owner Mick Welling has not staged racing at the track this year, however Dawn Forrest and her willing band of volunteers did a fantastic job in staging 8 races on what turned out to be a lovely sunny day. Again, annoyingly, the meeting wasn't well supported by the racing fraternity or general public in terms of spectating, which is something I know I will need to tackle next summer when, all being well, I join the new committee being formed to assist Mick in staging racing at York Harness Raceway. I was approached by one of the sport's leading sponsors and successful owners a couple of weeks back about joining such a consortium and was glad to help out. Hopefully we can get this off the ground and bring racing back to York on a more regular basis in 2017. Whilst on the topic of new roles I'm taking on, I was also approached about organising the 2016 Camden Stud/York Sale on October 8th by Mick Welling, something which I have agreed to do. I'm increasingly more sure that I've bitten off more than I can chew but I still suffer from the inability to say no, plus I would like to see the sale being staged. Shameless plug alert; here's the link to download the form from the BHRC website: Sale Entry Form. What a great day of racing it turned out to be. 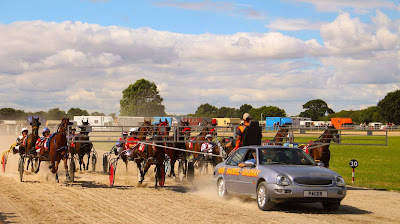 I was fortunate enough to be allowed onto the inside track, thanks to starter Simon Clarke and the stewards, to take some photos of the action in the high grade pace. 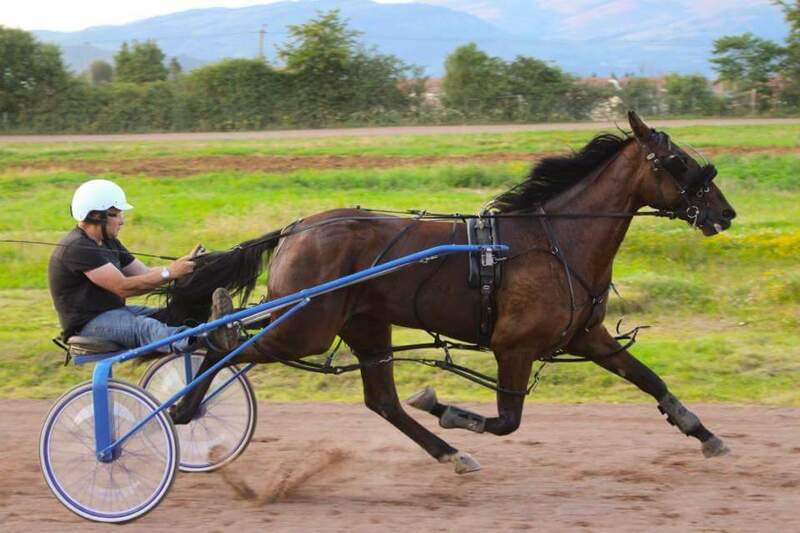 I also had to pay a visit to Steve Lees to ask if he would drive Ace in the Breeders Crown, after which I stayed in the paddock to watch the next race. It was probably the safest place to be stood as Ladyford Miracle veered right-handed down the home straight at the half and subsequently went straight through the outer fence into the car park - thankfully both the horse and the driver, Phil Arnett, were OK.
After the racing we went to my favourite place in the world to eat: the Anchor Inn in Whixley. It does the BEST carvery you've ever tasted in your life, and my only regret on Saturday was that I was too full to have one of their amazing homemade desserts! With York not being on this year, my trips to the Anchor have been reduced in number, having only visited twice this year so far (we went there after a point-to-point in Holderness back in the Spring). Here's shameless plug number 2; we will definitely be going there after YORK SALE ON SATURDAY 8TH OCTOBER for visit number 3. As we drove back towards the A1, Smarty asked if I wanted to 'drop into Leeds' to see if we could get tickets for the boxing. We had planned to head home from York, stop by the stables to check on everyone and then catch up on what we'd recorded, hopefully making it through to the Frampton fight which was scheduled for 02:30am. Smarty's plan would see us head to Leeds, which was allegedly half an hour away, watch the boxing, head home and be back just in time for the Frampton fight. I wasn't too keen on the idea but he questioned my sense of spontaneity and not wanting to be the killjoy, I agreed to go. We got tickets outside the venue and had a great night watching the likes of Sam Eggington, Tommy Coyle, Frankie Gavin, Luke Campbell, Dillian Whyte and Josh Warrington fighting. The only downside was that due to a stop for a sleep on the A66, we didn't get home until 6am on the Sunday! So much for making use of my day off, I think I managed minimal cleaning in the house and an afternoon nap! I did pull my weight over at the stables though; all stables and dog runs were cleaned out and bedded down, buckets washed and re-filled, walkways swept. I did stop and think of the irony of how 'stable-proud' I am compared to how not houseproud I am...nobody ever comes to my house though!! And that concludes the fortnight known to me as 'Weeks 12 & 13'. Fear not though, I have Week 14 to write and also if you keep scrolling down, you'll find a very disgruntled goat kicking about! - stealing people's thunder. OK, so I know it's a competition out there to be the top PR guru and people want/need to get their corner of the map in the forefront of people's minds in order to get them through the gate but I think perhaps there should be some sort of etiquette in the promotions world. Like, if an event is before another event, and someone who doesn't normally do pre-event promotion (more post-event analysis) makes the effort to drum up interest for a forthcoming event, then perhaps it would be nicer (i.e. less likely to put people's noses out of joint) if people waited until after the earlier event before pushing their own event. If that's not feasible, because events tend to fall in quick succession over a 2/3/4 day period, then how about waiting until a day or two after the initial promo for the earlier event, in order to allow that to have its maximum effect? Hey, maybe I'm being precious. Or maybe I feel like it's a case of who can shout the loudest. And although it is widely known that I can in fact shout the loudest, I'm not as prone to acts of volunteering as I used to be, and 'thanks' isn't a word often bandied around, so if it's a competition as to who can push their event the hardest, I'm pulling myself out of the race. - White Noise. A term penned by a fellow realist and myself whilst putting the world to rights last week. The less you say, the more people listen. Plenty of people could, and should, learn from that. 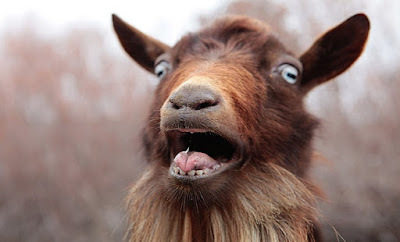 This goat is not happy.